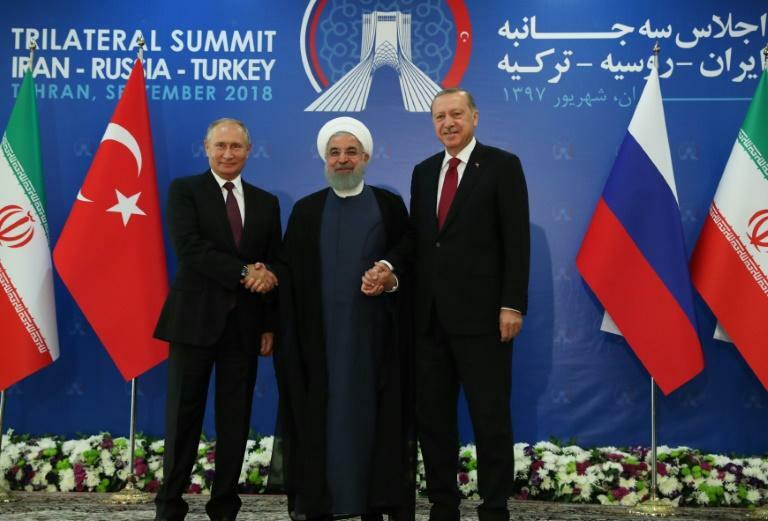 Iran, Russia and Turkey were unable to overcome their differences at a Tehran summit on Friday as they held talks on an imminent offensive against the last rebel stronghold in Syria, amid warnings from the international community of a looming humanitarian disaster. Turkey's President Recep Tayyip Erdogan openly disagreed with his Russian counterpart Vladimir Putin at a press conference in the Iranian capital and warned of a "bloodbath" in Idlib province, where an assault by Syrian government forces is expected any day. Iranian President Hassan Rouhani, who hosted the meeting, also warned against a "scorched earth" policy, but said "fighting terrorism in Idlib is an unavoidable part of the mission of restoring peace and stability to Syria." Russia and Iran are major allies of Syrian President Bashar al-Assad, while Turkey backs opposition fighters, including some present in Idlib, who are seeking his ouster. In front of the world's press, Erdogan criticised their joint statement for not including the word "truce", saying it would "strengthen and calm this process." Putin retorted that armed opposition groups such as the Islamic State group and al-Nusra front were not present at the talks to offer to uphold any ceasefire. "We cannot say for them... that they will stop shooting or stop using armed drones," Putin said. He also insisted Damascus "has a right and must eventually take under control all of its national territory". The three countries are guarantors of the Astana process, a track of talks on Syria's civil war launched after Russia's game-changing 2015 military intervention that has eclipsed Western-backed Geneva negotiations led by the United Nations. Putin said they had spoken of a "phased stabilisation" in Idlib and hoped "terrorist organisations will have enough common sense to stop resistance and lay down their weapons." Iranian and Russian support has shored up the Damascus regime, allowing it to regain the upper hand in the seven-year civil war which has claimed some 350,000 lives since 2011. Seized from government forces in 2015, Idlib and adjacent areas form the final major chunk of Syrian territory still under opposition control. It is home to some three million people. On Friday morning, Russian air raids pounded rebel positions in the southwest of Idlib killing five people, the Syrian Observatory for Human Rights said. Among them were positions of the jihadist Hayat Tahrir al-Sham (HTS) alliance, as well as of the hardline Ahrar al-Sham group, the Britain-based monitor said. 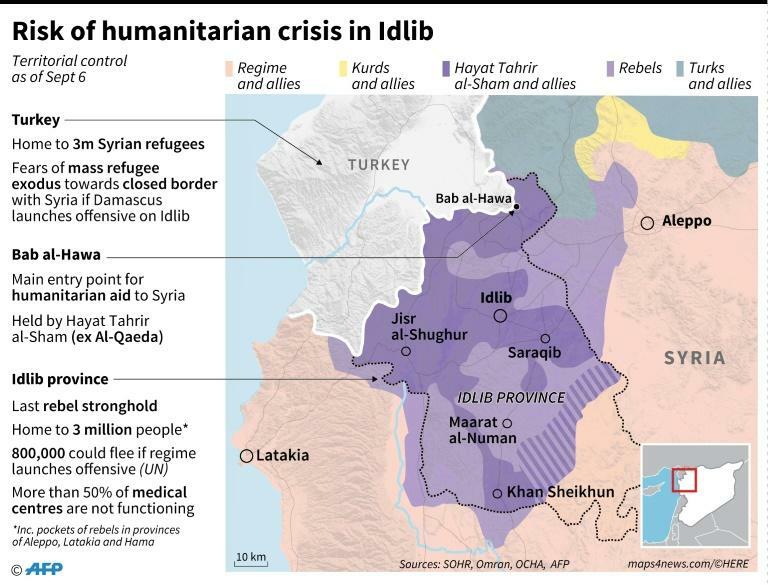 Hundreds of civilians have already begun to flee Idlib ahead of what could be the last -- and bloodiest -- major battle of the devastating conflict. Turkey, which has long backed Syrian rebels, fears the potential flood of desperate Syrians into its territory. "Any attack launched or to be launched on Idlib will result in a disaster, massacre and a very big humanitarian tragedy," Erdogan said. But Russia and Iran have sworn to wipe out "terrorists" and Assad has declared his determination to retake control of the entire country. A statement released at the end of the talks on Friday was low on detail and merely reaffirmed their commitment to keep working together. The UN Security Council was also due to meet late Friday, at Washington's request, to discuss Idlib. Russia wants Turkey, which borders the province, to use its influence to rein in the dominant group HTS, led by the former Al-Qaeda branch in Syria, as well as rival rebels. Turkey has limited sway over the jihadists who control an estimated 60 percent of the province, but it backs other rebel groups and has 12 military "observation points" across the area. Idlib's population has swelled as the regime chalked up a series of victories across the country, reaching evacuation deals that saw tens of thousands of people bussed there. Russia has said the Syrian army is preparing to solve the problem of "terrorism" in the rebel stronghold. "A total and definitive liquidation of the terrorists across all of Syria's territory is necessary," said Russian foreign ministry spokeswoman Maria Zakharova. Al-Watan, a Syrian newspaper close to the government, reported Monday the military operation could "immediately follow the summit".